Every maker has a story. Be a part of Chicone Cabinetmakers's story by placing an order, leaving a review, and seeing your review appear here. It will be hard to finish your work when the beauty of warm wood surrounds you. I named this contemporary desk after Keuka Lake where aviation pioneer Glen Curtis flew his early planes. The sweep of the sold walnut construction is accented by quarter inch inlaid figured maple. 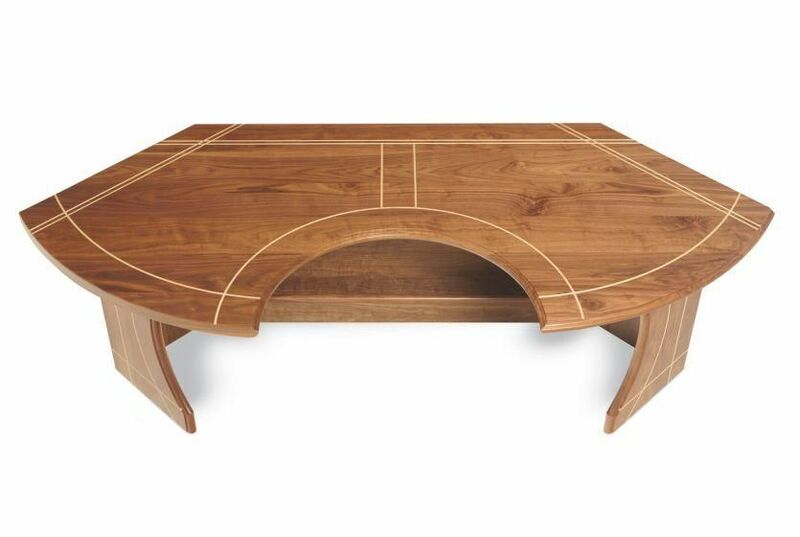 The desk is available with a solid walnut surround and complimentary maple inlays. The cockpit style round allows you to work the full surface of the desk. Inquire about custom mates to increase your workspace and complete the functionality of your office (these are not included in the price, examples are shown in the double photographs). Each piece is custom made-to-order, please allow 6-8 weeks. The price is for local pick up only. I can help arrange shipping; I offer standard crating and white glove delivery (pricing will vary).